Bellefonte, located in Centre County, Pennsylvania is easily accessible via Interstates 80 and 99. State College and the main campus of the Pennsylvania State University are only a short ten miles away. Free parking is available at Bellefonte Area High School, 830 East Bishop Street, Bellefonte, PA.
Free shuttle buses will transport visitors to the fair with 3 available stops: Bishop & Allegheny Streets, Spring & High Streets, and Howard & Allegheny Streets. Driver tips are welcomed. Shuttle transportation will run from 10:00 a.m. until 8:30 p.m. on Friday, August 10th and from 10:00 a.m. until 5:30 p.m. on Saturday, August 11th. 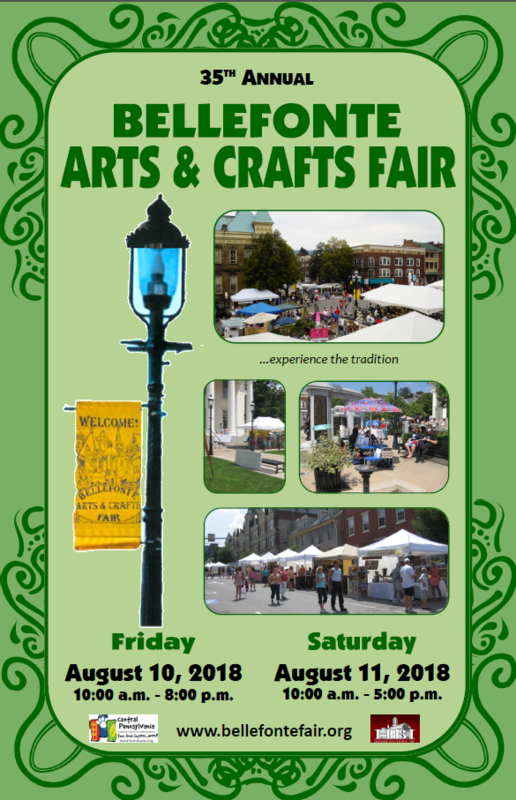 Become a 2019 Sponsor and join those businesses who support the Bellefonte Arts & Crafts Fair!